Pozy, steamed meat dumplings, a traditional dish of Buryat and Mongolian cuisine. Setting out, most travelers on the Trans-Siberian expect dramatic landscapes, picturesque towns and boundless forests. Few realize that an unforgettable series of culinary adventures also await. RBTH has selected six spots while keeping an eye on your budget. “What are posikunchiki?” is a question you’re likely to ask if visiting Perm (1,154 kilometers from Moscow) for the first time. These delicious snacks can be found virtually everywhere in the Perm region and the northwest of Sverdlovsk Region, although they’re virtually unknown elsewhere. A traditional Ural dish, posikunchiki are small fried pastries with spiced minced meat and onion filling, looking like a smaller version of “chebureki,” (deep-fried turnover filled with meat). Connoisseurs of Italian cuisine will notice a stunning resemblance to “panzerottini” (similar to a closed pizza), small “calzoni” with tomato and mozzarella or meat filling which can be found in Apulia and which, like posikunchiki, should be eaten with your hands. In Perm you’ll find many places where you can try posikunchiki, but the most delicious ones can be found at “Postoyaly Dvor,” a small restaurant in the picturesque village of Khokhlovka (45 kilometers north of Perm). It’s the ideal place for a bite after visiting the nearby open-air Museum of Architecture and Ethnography. Russia is not an easy country for vegetarians, however, things are rapidly changing. If you visit Yekaterinburg, the main city of the Ural region (1,417 kilometers from Moscow), take a walk along ul. Vainera, its lively pedestrian street and drop in at Rada, a cozy vegetarian café on the first floor of the “Krasny Leopard” shopping center. Here you’ll find a wide range of vegetarian dishes from all over the world (such as Georgian lobio and Middle Eastern falafel) and a delightful selection of meatless versions of popular dishes (plov, bigos and lasagna) and pastries. Irkutsk, “the Paris of Siberia” (4,202 kilometers from Moscow), is a must for all Trans-Siberian travelers, with its splendid baroque churches and colorful architecture. If you need a moment of rest during your visit, you’ll find a comfortable shelter at Govinda, a vegetarian café in the center that boasts of its being the first of its kind in town. Although Govinda is small and the list of dishes is not very long, it has an extremely pleasant atmosphere. Try its delicious vegetarian goulash or its desserts, which will delight your eyes as much as your stomach. Once you’ve reached Lake Baikal, there is no way that you won’t encounter pozy, which are everywhere. 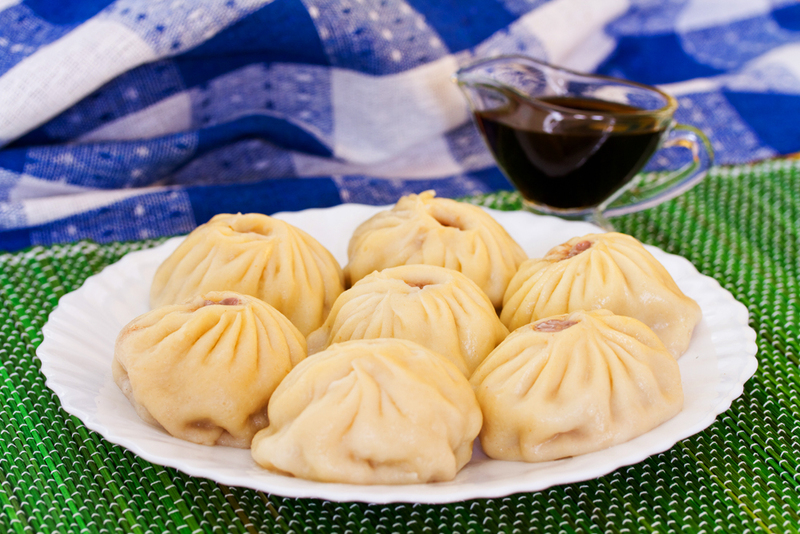 Also known as “buuza” (in Buryat) or “buuz” (in Mongolian), these steamed meat dumplings make up the most famous traditional dish of Buryat and Mongolian cuisine. In Buryatia there are even festivals devoted to them. Pozy are a relative and similar in name to Chinese dumplings (bao-dzi), while their appearance recalls Georgian “khinkali” and Tatar and Central Asian “manty.” They are salted meatballs of minced mutton or beef seasoned with herbs and garlic or onion and folded into a pocket of dough with an opening at the top. Similar to khinkali, you should eat them with your hands and drink the sauce inside after the first bite. If your trip includes a stay in Khuzhir, the biggest village on Olkhon Island (4,335 kilometers from Moscow), drop in at Yurta, a cafe located on ul. Pushkina. As the name itself suggests, it’s a very small café located in a wooden yurt. Don’t let the modesty of the exteriors deceive you: this is one of the best places in town and its pozy are absolutely delicious. If feeling drowsy after eating too many pozy, cross the street to the wooden house with the painting of an old bearded man on its wall. Welcome to Khuzhir’s Art-Café, where you’ll find what is probably the best cappuccino east of the Urals. Sip your coffee on the upstairs terrace and enjoy the gentle breeze and soft music in the background. Whether you’re beginning or ending your Trans-Siberian journey in Vladivostok (6,416 kilometers from Moscow), a good way to say farewell to Russia’s Pacific gates is to visit the Tokarevsky Lighthouse, located at the edge of the Gulf of Peter the Great. On your way there (or back) you can stop at Goryanka, a restaurant specializing in Karachay cuisine. Karachay food may not be as well known as Georgian or Armenian (it has shashlyk kebabs and spicy meat soups in common with them), but it does have its own masterpiece: khychiny, big round pies similar to Georgian khachapuri. Khychiny are filled with either meat and herbs or potatoes and cheese and are extremely filling. All kinds of khychiny are good here, but the simple meat and vegetable soups are also worth trying. It is often crowded here, but the lively ambience on its summer terrace make it worth the wait. Find more info on Russian cuisine and delicious events in the Russian Kitchen!